The Sheridan School District will host two dedication ceremonies of seven historical markers for Grant County to support the education and appreciation of local Civil War events. The first ceremony will be held for students at Sheridan Intermediate School during a school assembly on Nov. 6. A dedication for the public will occur Nov. 7 at 2 p.m. Both events will be held at McKenzie Auditorium at Sheridan High School. The Arkansas Heritage Department’s Civil War Sesquicentennial Marker Project approved the seven historical markers, which depict aspects of the Battle of Jenkins’ Ferry. The markers are funded by the Civil War Sesquicentennial Commission and the Arkansas Humanities Council. Sheridan School District Gifted and Talented / Advanced Placement Coordinator Roy Wilson completed the marker and grant applications and selected the marker topics. Wilson was designated as the project director by DeeLois Lawrence, the president of Friends of Jenkins’ Ferry Battlefield, which is the sponsoring organization. 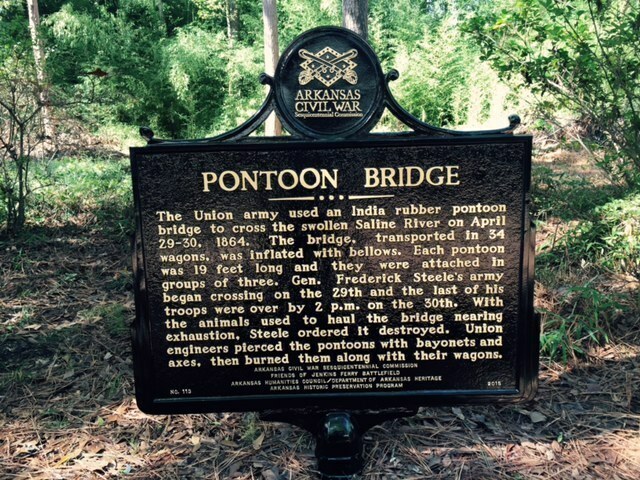 These historical markers present an overview of major events and situations experienced by the soldiers and civilians involved. • Destruction of Whitten’s Mill / Clash with Elliott’s Brigade. Their eventual location will stretch nearly 10 miles from the artillery exchange at Guesses’ Creek at the edge of Dallas County, south of Leola, through Leola and the Dogwood Community to Prattsville. This closely follows the route of the Union Army before and after the battle. Two of the seven markers were accepted by the Arkansas State Parks and will be placed within Jenkins’ Ferry State Park along State Highway 46 near the Saline River. The other markers have been accepted by area landowners.